The Word Apologetics: Christian apologetics doesn’t mean saying sorry for being a Christian. The confusion arises because, in modern English, the word “apology” has a different meaning from the classical Greek word (apología)from which it was derived. Apología meant a defense or justification of one's beliefs, attitudes, or actions. For example, The Apology is Plato's version of the speech given by Socrates as he defended himself in 399 BC against the charges of corrupting the young by not believing in the gods recognized by the state, but inventing new deities. In other words, apologetics is the discipline of defending a position through the systematic use of information. Christian apologists also set forth positive grounds for Christianity. Criticism: Most critics of the Bible assume that because something is unexplained it is unexplainable. When a scientist comes across an anomaly in nature he doesn’t give up on science. How many NASA scientists resigned when they found rings around Jupiter which was contrary to all scientific explanations? When the Bible has been proven to be accurate over and over again in hundreds of details the burden of proof is on the critics, not on the Bible. Most skeptics do not bring to the Bible the powers of comprehension and interpretation, that they would bring to a reading of the average newspaper. Perhaps this uneven treatment should not be surprising. After all, the skeptic has much to lose if the Bible is right. Unfortunately, most Christians have not been able to give adequate answers to the questions skeptics ask as most churches are woefully lacking in the teaching of apologetics. This is particularly sad as there are virtually no so-called Biblical discrepancies that do not have an explanation. As a result, the world thinks Christians cannot defend the authority of Scripture and, thus, the Christian faith. The issues addressed in this section are but the tip of the iceberg, but for those who would like to be “ready to make a defense to everyone who asks .....” (1 Peter 3:15) See resources at the end of this page. Does The Bible Contain Contradictions? Does the Bible contradict itself? That charge is frequently made by skeptics. A careful consideration of the "law of contradiction, " however, will demonstrate otherwise. Alleged Bible Errors After forty years of continual and careful study of the Bible, I can only conclude that those who have "discovered a mistake" in the Bible do not know too much about the Bible—they know too little about it. This does not mean, of course, that we understand how to resolve all the difficulties in the Scriptures. But we have seen enough problems resolved to know these also admit answers. Was the New Testament Influenced By Pagan Religions? Many Christian college students have encountered criticisms of Christianity based on claims that early Christianity and the New Testament borrowed important beliefs and practices from a number of pagan mystery religions. Since these claims undermine such central Christian doctrines as Christ's death and resurrection, the charges are serious. But the evidence for such claims, when it even exists, often lies in sources several centuries older than the New Testament. Moreover, the alleged parallels often result from liberal scholars uncritically describing pagan beliefs and practices in Christian language and then marveling at the striking parallels they think they've discovered. Conflicting Accounts of Creation? ...Aren’t the creation accounts in Genesis chapters 1 and 2 in conflict? 6000 or millions of years old? ...A brief look at the Young Earth / Old Earth theories. Noah's ark ... Big enough to carry two of every species? The Flood ..Global or Local? Scientists from NASA/Goddard Space Flight Center and Columbia University have uncovered evidence that confirms there was once a massive flood in the northern hemisphere. Includes The Seattle Scablands and The Rainbow. Methuselah lived how long? ...Is it possible that people lived hundreds of years like the Bible says? Who did Cain marry? ...If Adam and Eve were really the first people, where did Cain find his wife? 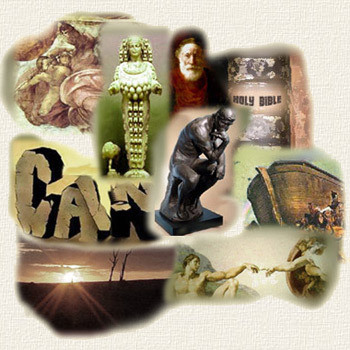 Who helped Cain build a city? Bible is filled with various discrepancies and contradictions. every non-Christian and Christian has asked.